While I don't live in London, I do get invited to London blogger events and I graciously accept these invitations! It's always nice to take a trip down to the big city and take in the scenes. However, I am always happy to return to my little town and away from the noise! 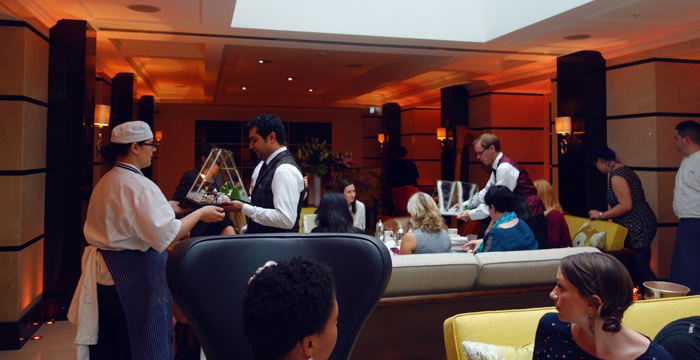 This time around, I was invited to the gorgeous Conrad London St. James to preview their Sparkling Christmas Afternoon Tea. 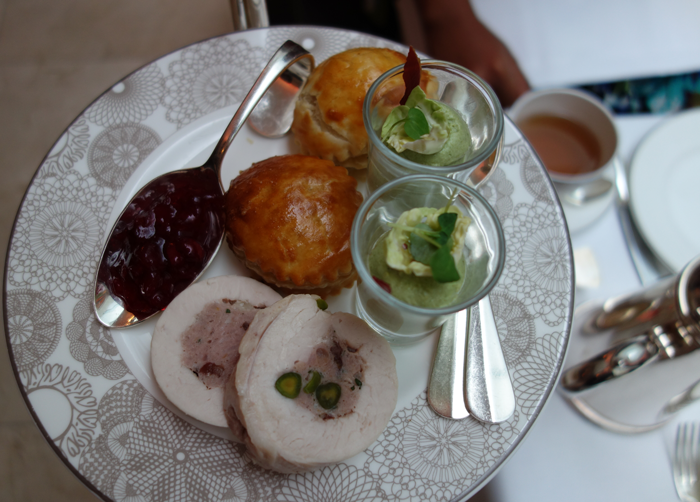 While I still feel like a newbie to afternoon teas, I thoroughly enjoy them. Especially when bubbly is involved! 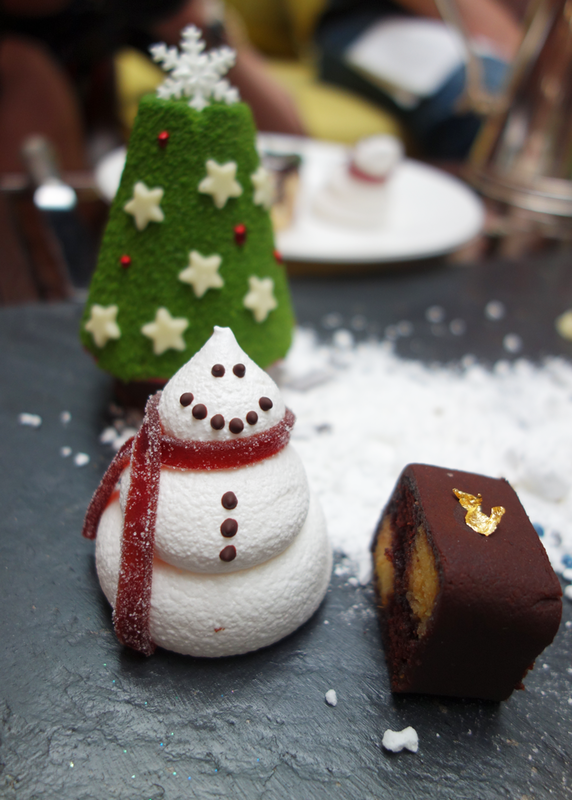 It was a little funny to be eating Christmas themed treats so early in the year! This was back in October and it actually happened to be a warm and humid day. But it definitely put a smile on my face. And of course, the bubbly helped with that as well. We mingled for a bit before the tiers of goodies were brought to our tables. 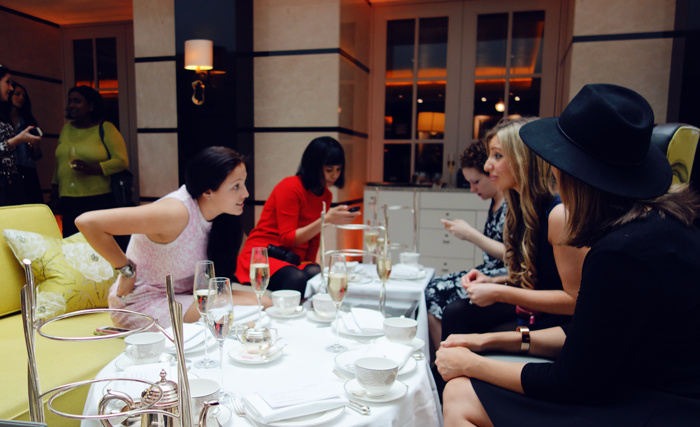 After a couple of glasses of Laurent Perrier, I opted for a white jasmine tea, which is my go to tea these days. The goodies arrived and we were in awe of the lovely arrangement. The top tier was a lovely mini Christmas feast including a brussel sprout shot, which was absolutely delicious, turkey ballotine and a venison bite. Each dish was very flavorful and I savoured every bite. I am always amazed by bite sized perfection! 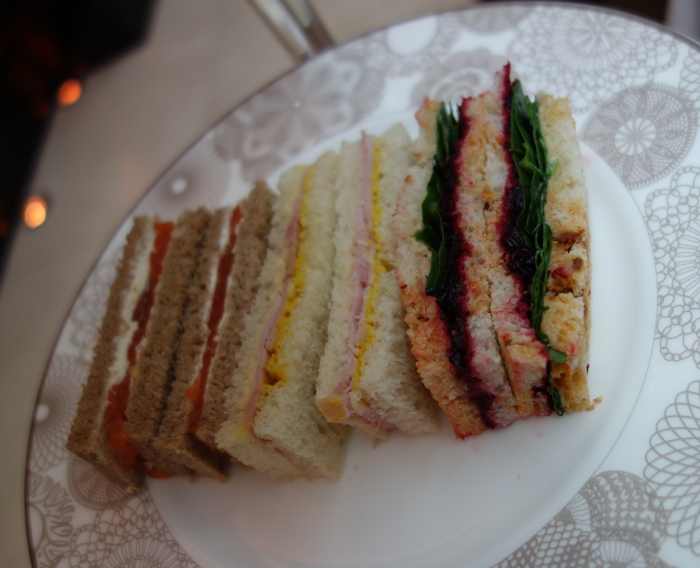 Next up, the finger sandwiches. Including Smoked Salmon and Lemon Cream Fraiche, Cured Gammon and Mustard, and my favorite, Beetroot and Spinach. 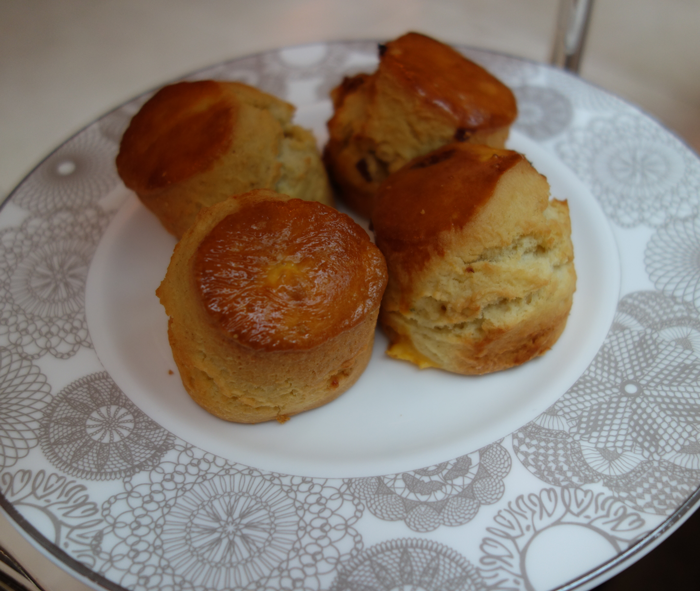 And last but certainly not least, the scones! There were two types for us to try, the orange and cranberry scone and the Christmas spiced scone served with Devonshire clotted cream (of course), strawberry jam and blackberry curd. You just can't go wrong with flavors like these! You would think we would be done with the tea, right? Well, we still had the main piece awaiting us: The Christmas desserts. 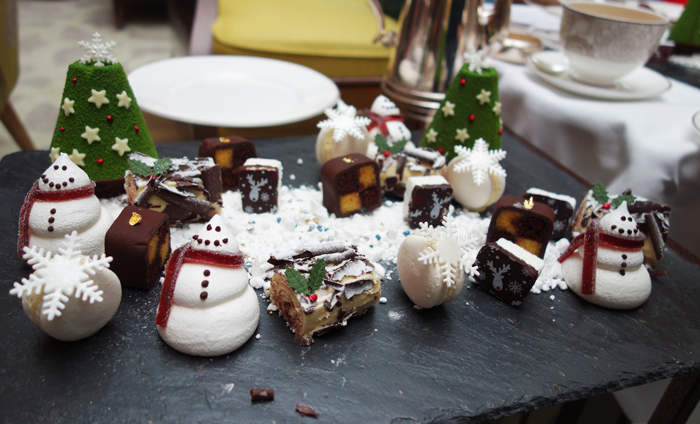 Served up to us as a piece of art, it was hard to demolish these pretty little treats. 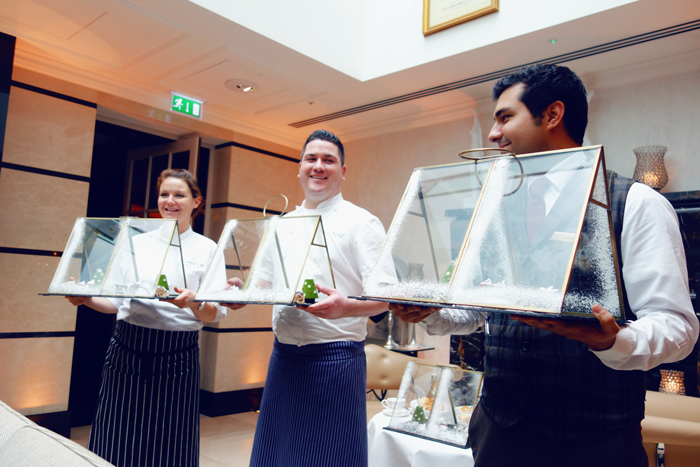 I loved the creative snow covered window pane that covered the desserts. Such a nice touch. 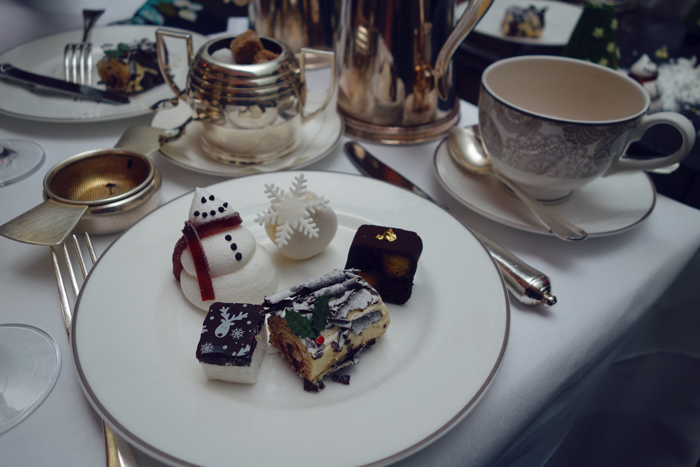 The desserts included mini meringue snowmen, Christmas postcard marshmallows, white forest yule log, a snowflake macaroon, chocolate orange Battenburg present, a winterberry Christmas tree and even edible snow! Can you find each one of these below? I enjoyed each of these but my favorite was the yule log. 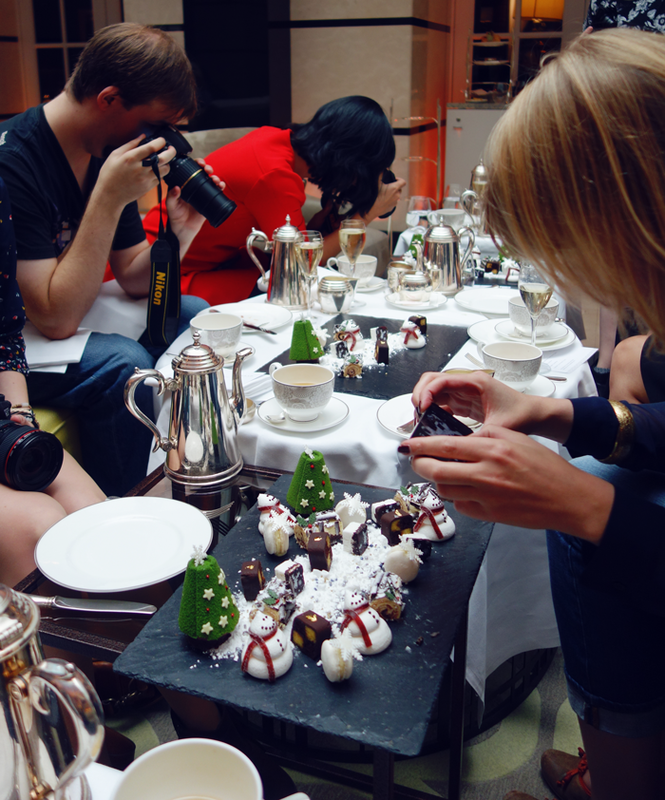 Typical blogger event....all of us snapping away before digging in! 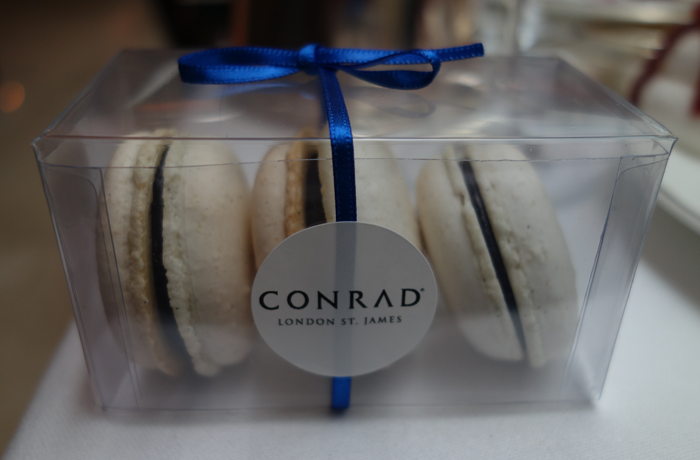 After we were all truly fed and full, we were given a little takeaway box with some delicious macaroons. It was so nice to be able to bring something home to Van so he wouldn't have to just hear me gush about how amazing it all was. 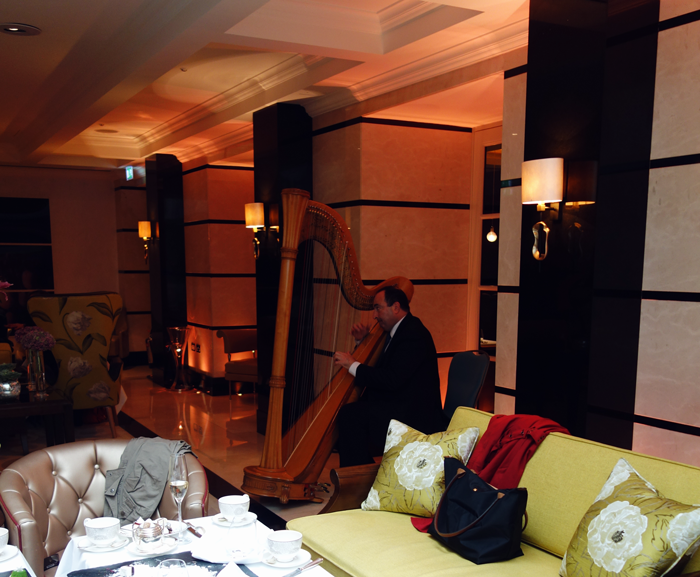 As we sat around and chatted in the gorgeous dining area, the harpist played us lovely Christmas songs to get us in the spirit. 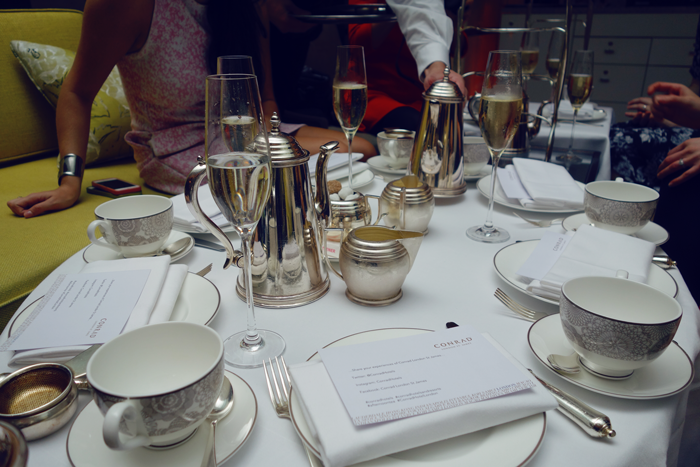 It truly was a special tea, one that I would return to if I had the chance! 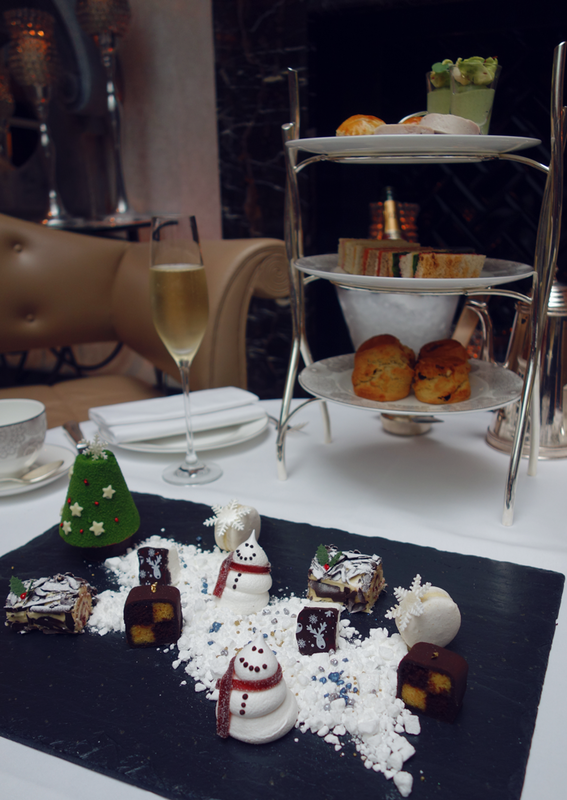 If you are looking for a luxurious afternoon tea to get you in the holiday spirit, look no further than Conrad St. James! 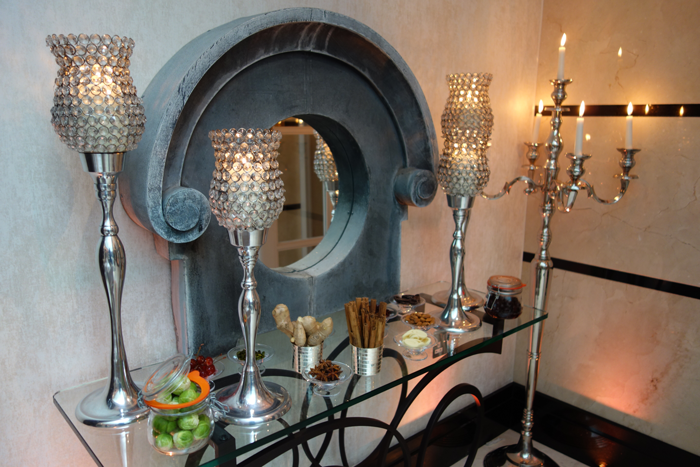 The setting and the service are impeccable! I was given a discount for my tea, but all opinions are my own. What a fun day! 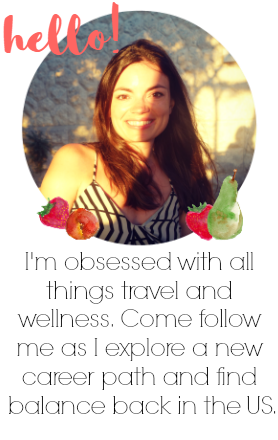 I'd love to attend any blogger conference! Those desserts are so cute! I know it does!! And it's still not quite cold enough to feel like Christmas yet! It was such a feast! Normally tea is just the three tiers and thats it! I couldn't believe how much we got and of course the free flowing champagne was a nice touch! We all were polite and waited until everyone had taken a million pictures before we dove in haha! Wow those Christmas treats look amazing! I would have struggled to be able to eat them just because of the prettiness! Also Brussel sprout shots sounds.. well interesting! The brussel sprout shot was so interesting....it was mixed with goats cheese into a sort of mousse and it was seriously delicious! Mmmm, yule log. I love yule log!! 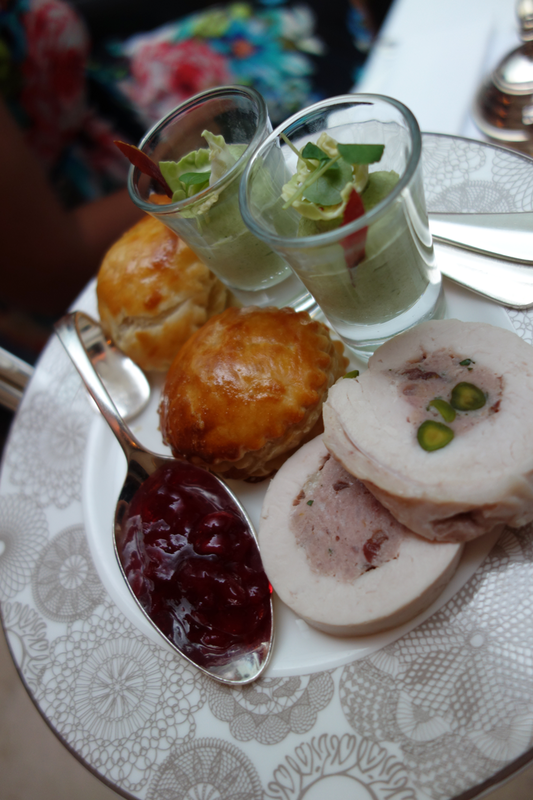 I need an afternoon tea sooooon. Beautiful shots! Even though it's been over a month, I still remember how good this food was! At least I can live vicariously through you! Looks like such a fun event!!!! That food looks amazing!! !